All three healthcare companies' stocks fell hard after they announced intentions to raise capital. After the companies announced their intentions to raise capital, shares of Flexion Therapeutics (NASDAQ:FLXN), Lantheus Holdings (NASDAQ:LNTH), and PDL BioPharma (NASDAQ:PDLI) all dropped by double-digits in early morning trading on Wednesday. Flexion, a biopharma focused on products that treat osteoarthritis, announced on Tuesday that it would be beefing up its balance sheet through a common stock offering. Flexion released the details of the proposed deal on Wednesday, stating that it would sell 3.6 million shares of stock for $18.00 each. That would provide the company with roughly $64.8 million in new capital before deducting fees. The underwriters of the deal were also granted the option to buy an additional 540,000 shares. Investors appear to be less than thrilled with terms of the deal. That makes sense, as the $18 price represents a sharp discount to Tuesday's closing price of $20.29. Shares fell by as much as 11% in response. Investors in Lantheus Holdings, a company that specializes in diagnostic imaging agents and products, are also having a tough day after management shared more details about its proposed share offering. Lantheus said on Tuesday that it would be selling 3 million shares of stock, but on Wednesday it announced its intentions to upsize the deal to 3.5 million shares. On the surface, that sounds good, until you realize that 2.5 million of those shares are being sold by existing shareholders, not the company itself. This means that a larger-than-expected number of current shareholders are looking to cash out. Shares dropped by as much as 11% as a result. Finally, PDL BioPharma, a company focused on generating royalty revenue off of pharmaceutical patents, dropped by as much as 20% after the company announced that it is selling $150 million in convertible bonds due in 2021. In addition, another $22.5 million worth of bonds could also be purchased by the underwriters of the deal. The exact terms of the deal were not announced, but PDL did state its intentions to use the proceeds to pay off a portion of notes that are due in 2018. In connection with the deal, PDL was notified that buyers of the notes will make use of derivatives to help hedge their exposure. The use of those derivatives is expected to have an impact on the company's share price. Investors are reacting harshly to the news, sending shares plunging in response. It is no surprise to see that some healthcare companies are attempting to raise capital right now. 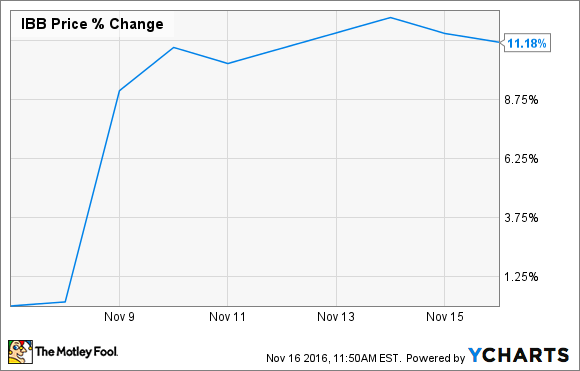 After all, stocks have rallied sharply over the last few days in response to Donald Trump winning the election. Biotechnology stocks, in particular, have performed exceptionally well. Have a look how much the iShares Nasdaq Biotechnology ETF (NASDAQ:IBB) has rallied since Nov. 7. While raising capital can often cause a company's stock to move one way or the other in the short term, it usually doesn't have much of an impact on the long-term potential of the businesses. As such, if you were bullish or bearish on any of these stocks prior to today's move, I see no reason to change your tune today.